NETWORK FINALS: MASTERCHEF gained 0.1 and the season finale of THE F WORD lost the same in final numbers. In addition, SALVATION was rated as a 2-hour, and emerged at 0.4. CABLE HIGHLIGHTS: Bravo notched a narrow win in Wednesday cable, with REAL HOUSEWIVES OF NYC down 0.03 to 0.59, and lead-out ODD MOM OUT up 0.02 to 0.19. VH1’s BLACK INK CREW climbed 0.08 to 0.58, and SIGNED ticked up to 0.35. Discovery’s ALASKAN BUSH PEOPLE jumped 0.14 to 0.52. USA’s THE SINNER continued to impress, up 0.08 to a new high 0.51, while lead-in SUITS was up 0.08 to 0.41. There may never be a night again that isn’t busy for cable news, and last night belonged to MSNBC’s RACHEL MADDOW SHOW at 0.43/3.2M, over CNN’s ANDERSON COOPER 360 at 0.35/1.5M, and Fox News’s THE FIVE at 0.30/2.5M. FX’s SNOWFALL rose 0.05 to 0.41. The timeslot midseason premiere of OWN’s GREENLEAF was at 0.36, down a tenth from Tuesday’s installment. On ID, MURDER BY NUMBERS gained 0.04 to 0.35, and THE PERFECT MURDER was up 0.06 to 0.30. On HGTV, HOUSE HUNTERS INTL ticked up to 0.33, HOUSE HUNTERS was down 0.05 to 0.31, and PROPERTY BROS slipped 0.03 to 0.28. MTV’s CATFISH edged up 0.02 to 0.30, and UNDRESSED was at 0.20/0.19. On Lifetime, COUPLES RETREAT ticked up to 0.27, and GROWING UP SUPERMODEL premiered at 0.12. Food Network’s COOKS VS CONS ticked up to 0.25. 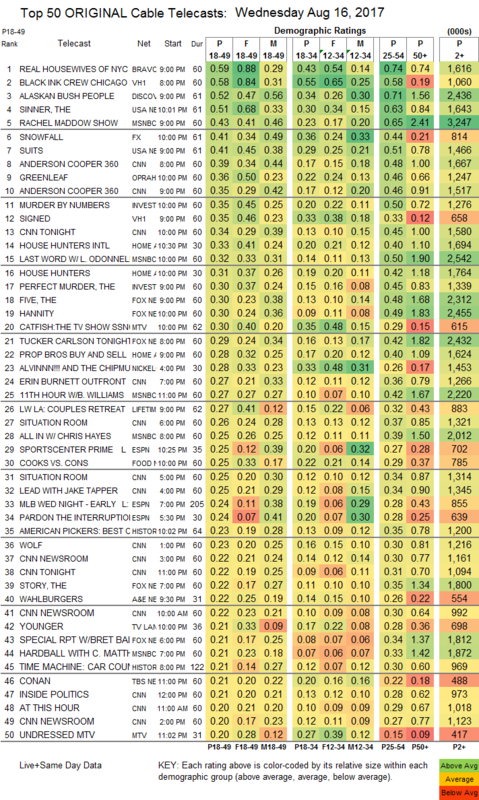 On A&E, WAHLBURGERS was at 0.19/0.22, compared to last week’s 0.24/0.22, and THE LOWE FILES was up 0.01 to 0.14. TV Land’s YOUNGER climbed 0.02 to 0.21. 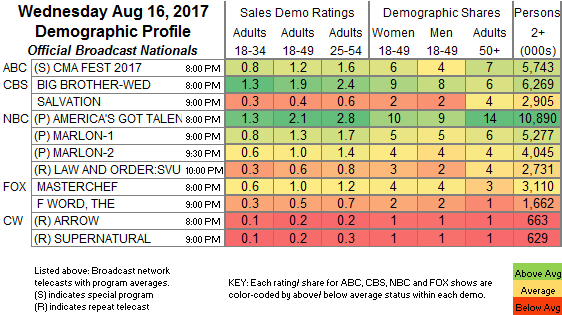 E!’s HOLLYWOOD MEDIUM ticked down to 0.20. On Tru, INSIDE JOKES dropped 0.03 to 0.19, and the just-renewed I’M SORRY was down 0.03 to 0.15. Syfy’s BLOOD DRIVE ticked down to 0.10. The series finale of BBCAmerica’s BROADCHURCH rose 0.02 to 0.07. Off the chart, IFC’s BARONESS VON SKETCH SHOW fell 0.02 to a nearly invisible 0.01/76K.